Claw toe refers to a frequent deformity of the toes, very often in women, revealed by a conflict between the deformed toe and the shoe or the ground. As with hallux valgus, mechanical causes may favor the occurrence of claw toes. Narrow and short shoes tighten the toes and offer them a limited space. High heels act similarly by propelling the forefoot and the toes against the tip of the shoe. Many forefoot patterns are described, among which the “greek” forefoot. In this case the second toe is the longest, and even longer than the great toe. The consequence is an increased risk of 2nd toe deformity where the toe abuts against the tip of the shoe. Greek foot : the second toe is longer than all the others. It comes butting up against the shoe tip. The global foot morphology is also an important parameter. Cavus feet, in which the arch is too high, is frequently associated with claw toes. The metatarsal bones are very vertical, which initiates the toes deformity. Symptoms appear after many year of evolution. Finally, other forefoot conditions such as hallux valgus are a very frequent cause of claw toes because the entire second ray is mechanically overloaded. The plantar joint’s anatomical elements get torn and the deformity settles. These are the most frequent causes of claw toes, but many others are described. Except the big toe, all the toes have 3 phalanx. Three joint can participate to the deformity : metatarso-phalangeal (MP), proximal inter-phalangeal (PIP), distal inter-phalangeal (DIP). the most classical and frequent: the “proximal” claw toe. The deformity concerns the PIP and a callus appears at the dorsal aspect of this joint. the “distal” claw, also called in a hammer toe: the deformity concerns the DIP with a callus at the dorsal aspect of this joint and/or on the fingertip. the “total” claw toe: it is the addition of the previous ones. the lest frequent: the “reversed” claw toe, also called “swan-neck shape”. The deformity also concern the PIP and DIP but the calluses are located on the dorsal and plantar aspects of the toe. Claw toe: “proximal” claw toe with a dorsal callus at the dorsal aspect of the PIP joint. Claw toe: “distal” claw toe with a dorsal callus of the DIP joint and a pulp callus (not visible here). Claw toe: “reversed” claw toe with a dorsal callus of the PIP joint and a plantar callus of the DIP joint. The claw toe’s evolution must be taken into account. At te beginning, the deformity is reducible. After time the joints stiffen and the claw toe becomes fixed. If the evolution goes on, a MP joint dislocation can be observed. These stages of evolution must be identified because the treatments are different. Usually, the claw toe deformity respects the axis. However a deviation may occur which makes the toes overlap. It’s called a “supraductus” toe (when it comes over an other) or “infraductus” toe (when it comes under an other). An other related disease is called “interdigital corn”. Two adjacent toes are tightened against each other and the bone reliefs come into contact. The skin suffers and two calluses appear, one facing the other on both toes. The main consequence of the claw toes is the skin’s reaction. The deformity creates a conflict between the toe and the shoe or the ground. The skin thickens on the conflict area and calluses appear. They can be located at dorsal aspect of the toe, but also under the toe or at the end on its pulp. These calluses are source of pain, very intense when they are on the pulp. Without treatment, the cors can get infected after the formation of wounds on their surface. These infections put the underlaying joint at risk. An arthritis and even an osteitis, can then occur. The very first solution is adapting the shoes’ choice according to the deformity. Of course, flexible and large shoes are privileged. The podiatrist is the health professional the most able to treat calluses. He removes it in surface, where the corn is very thick. Therefore he uses scalpels similar to the surgeon’s. This is useful but temporarily because the callus comes again as the conflict with the shoes continues. Another way of treatment is the making of a mould in silicone to protect the toes. It’s called “orthoplasty”, made by the podiatrist to prevent the contact between the calluses and the shoes. They act as a protection but dont cure the cal toe, even when it’s reducible. Finally, physiotherapy can help to preserve the joint’s flexibility (that’s to say mobility). This treatment requires regular and uninterrupted care. When physiotherapy stops, the deformity comes again. Silicon custom made “orthoplasty” useful to postpone surgery. An essential rule in orthopaedic surgery is to do surgery only in case of real symptom. And of course, it takes place only after failure of the more simple treatments described above. Only one circumstance has to make the surgeon opt for a preventive surgery: a high risk of infection. For example, a diabetic patient has important risks to develop infections because of the disease. In this situation he should not wait and let the infection worsen. What’s more, this patient has also healing difficulties that will make the situation even more delicate if it worsens. Other pathologies may make adopt the same attitude, like in case for neurological diseases or lower limbs arteries obstruction. The isolated removal of the callus isn’t sufficient because the callus is only the consequence of the deformity. The aims of surgery are to lay the toe back to the ground and avoid recurrence. Soft tissues: tendons and joint envelops. They participate to the deformity as they get retracted, which keeps the toe from laying back to the ground. They are thus sectioned. Bones and joints : they are the “victims” of soft tissues’ retraction. However, the bones are sectioned (osteotomy) and the joints blocked (arthrodesis or fusion) to keep the toe straight on the ground. Two families of surgical procedures are used. However, they both aim to respect the fundamentals above. The calluses are removed through short incisions. They allow access deeper to the other anatomical structures. Tendons, bones, and joints, are then corrected according to the surgical procedures described above. However in open surgery, they are performed under visual control. 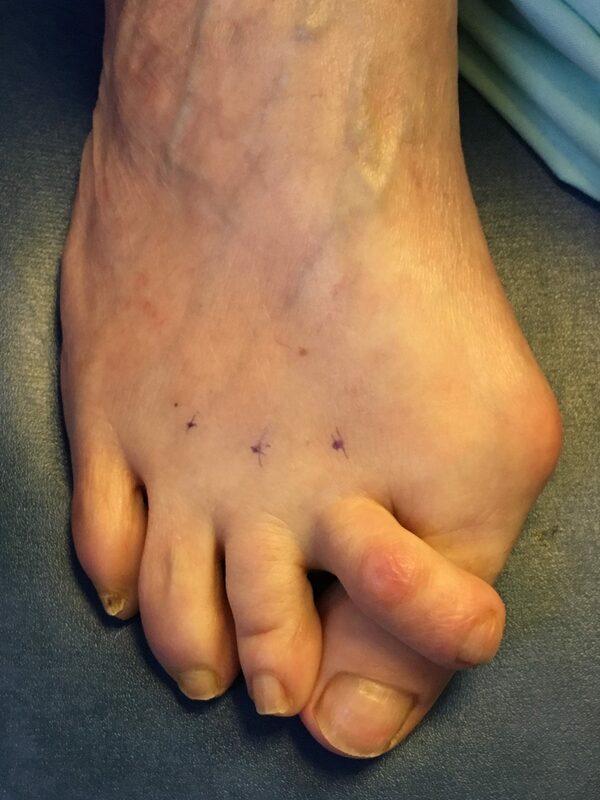 Claw toe: correction of the deformity after surgery. The use of metallic or non-metallic hardware isn’t mandatory. Corrections can be fixed with removable K-wire. Pushed out at the toe’s tip, they are removed in consultation without any pain, a few weeks after surgery. 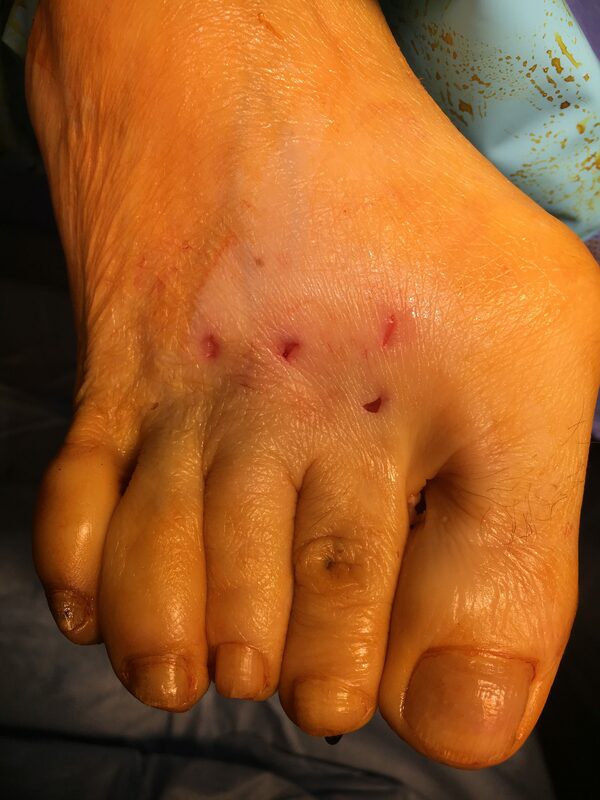 Claw toes: PIP arthrodesis fixed with removable K-wires. 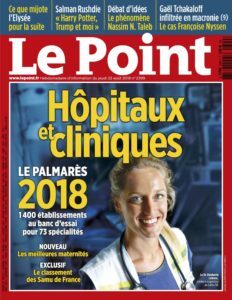 Percutaneous surgery appeared recently in Europe and especially in France. These new procedures need to obey to the same fundamentals as classical open surgery. The difference lies in the way of performing the different steps. Soft tissues are sectioned through millimetric incisions. Through the same kind of incisions, osteotomies and arthrodesis are performed with a motorized rotative burr. Taking into account the very little size of the incisions, hardware implantation is excluded expect K-wires that because their insertion in possible percutaneously. 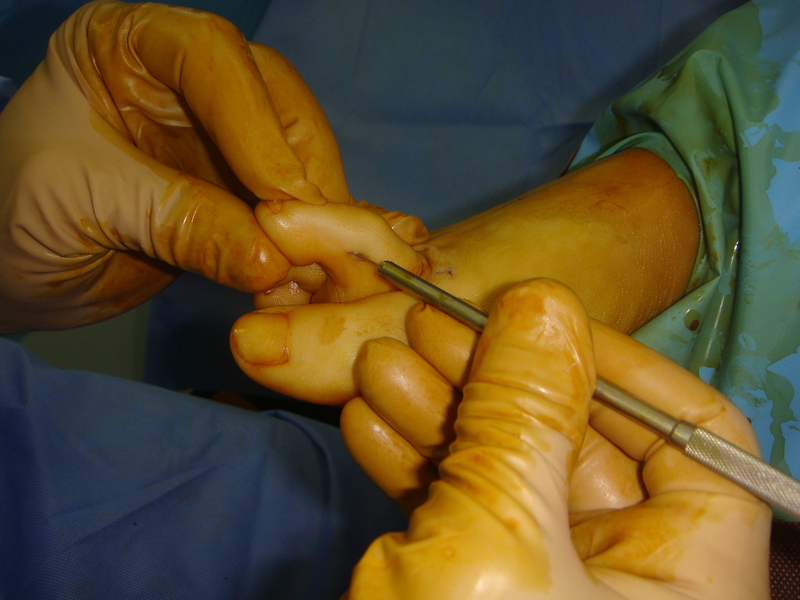 Claw toes: percutaneous tenotomy of the flexor brevis tendon. Claw toes: percutaneous tenotomy of the extensor digitorum longus tendon. The callus is not removed and will regress in few weeks since the cause has disappeared. 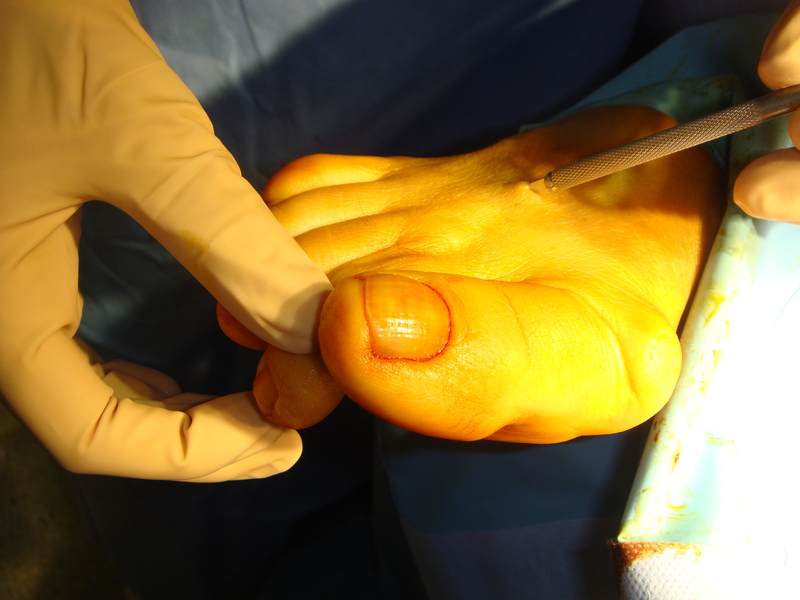 The patient should not worry if he notices remaining callus after surgery. The outcome is easier because the procedures are less aggressive, but complications do exist as much. This must be kept in mind even with this apparently more simple surgery. These procedures are difficult to learn and the surgeon has to be solidly trained, includingly with cadaver procedures.